23th July 2018-Cross Culture Team performance Enhancement was an interesting training programme conducted at client office. 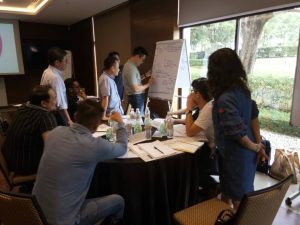 This training mainly focused on understand how business evolves as it grows over time. Understanding the reasons on how a company advances by its strengths but hitting bottleneck due to the same factor. This training enable the participant to understand why change happened and how organization grow over time. Learn different stages of change and the role of leader at each stage of change.Learn how to step by step lay out and announce the change. During these sessions, there was lots of fun. Participants learn through doing. Participants were keen to try and participated actively and had a good laugh through the role plays. There as deep and insightful discussion throughout the session. Participants felt energised and becoming more and more confident as they went through the class. 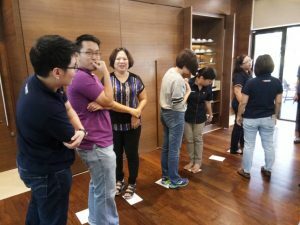 This training was conducted by one of our experienced trainer Mr. Bryan Ng, who has a wide-ranging in management, psychology as well as financial knowledge. His diverse experience makes his training unique and well received by the participants. The participants finds his class very lively and cheerful and he makes sure that the participants enjoys the training whilst gaining the knowledge.